You are here: Home / Materials, Tools & Skills / Is Your Show a Sitcom or a Movie? Is Your Show a Sitcom or a Movie? Some of you may have heard me talk about the difference between your record and your live show being like the difference between a sitcom and a movie. I’d like to expand on that concept. I have recently been at workshops with about 100 artists and bands. Most of the artists and bands are good. But the biggest mistake I come across when working with artists is the song arrangements they use. In most cases, what every artist does is play the song exactly as it was recorded: typically it’s short intro, verse, chorus, verse, chorus, bridge, chorus. People ask me what a Live Music Producer does; and they want to know what the “key things” are to making a good live show a great live show. One of the major things I do is rearrange your radio song into a live show song. This is at the top of the list of “key things” (or certainly near the top)! A good example of the difference between a sitcom and a movie is The Simpsons. The Simpsons is a 30 minute show – or more accurately, a 22 minute show with 8 minutes of commercial advertising. The writers know it has to be 22 minutes, or it won’t get aired on television. Similarly, your songs need to be short (3 – 3 1/2 minutes), to the point, and catchy, if you want them played on radio. But live is different! The Simpsons came out with a movie several years ago. If you’d gone in and dropped 8-10 bucks at the theater, just to watch several 22-minute sitcoms strung together, that you could have watched on TV, you’d have felt ripped off. Why? Your expectations are different when you walk into a theater than they are when you’re sitting in front of the TV. It’s the same thing with your music. Audience expectations are different for radio than for live, and it’s crucial for you to understand the difference if you want to be great live. Let’s take the intro of your song, for example. On radio, it’s no more than 12-13 seconds – we have to get into the first verse before the listener switches stations. But if you’re playing live, this is completely wrong! An intro is supposed to do just what it says: make an introduction. Those of you who are indies (not married to your audience, but dating instead) – you need to make your intros captivating! Your intros need to be developed, so when you start singing, the audience is completely with you. Usually it means lengthening the intro, directing the audience’s attention to what’s in the intro, and setting up the verse by leaving space before it begins. It’s a technique I’ve developed over the years in my Live Music Method that makes a huge difference in how your songs are communicated to the audience. You create anticipation for the song, for the lyrics, with this technique. I’m constantly asked how to move comfortably onstage and to help artists with what songs should go where in the set. 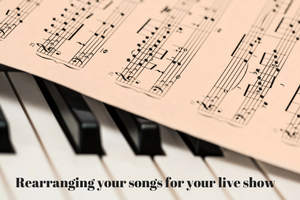 But, before we come up with a set list or learn how to move onstage, the songs have to be rearranged for live! One of the biggest compliments I get after working with an artist, is when the manager, label, or artist asks if I’ll produce their next record. For about 20 seconds I revel in the praise! Then I come to my senses. I tell them if they want a very expensive, mediocre record, I’m your guy! My world isn’t the studio, and I don’t arrange songs in hopes of making a radio hit. What I do is help artists who go onstage connect with their audience. After working with artists, I constantly hear feedback from them on how the new song arrangements are working for their live shows. They are selling more merch, getting more bookings, etc. One artist told me what happened after I worked with them on the first song in their set. I had helped them rearrange everything in the song from the intro, to the verses, the chorus, and on through the trash can ending. The first time they performed it they were blown away at the fact that the audience started clapping before the song was over, and then gave them a standing ovation! From that time on, whenever they opened a concert with that rearranged song, the applause started before they were even finished. If you’ve learned this concept through my teaching, I’d like to hear from you, too. How has it helped your live show?